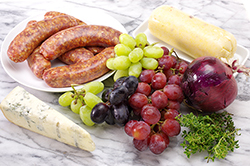 The basics of this dish are a well-balanced equation – sweet fruit, salty meat, mild polenta, and sharp cheese. (Just regular math, you know.) The end result is a winner, and you can make it your own by customizing the basic parts to suit your fancy. Prefer spicy sausage? Yes. Tomatoes instead of grapes? If that’s what you’ve got. Goat cheese for Gorgonzola? Fine. Just keep the basic balance, and dinner will hit all the right notes. 1. Preheat the oven to 425°F with one rack about 4 inches from the broiler and another in the center position. Mist a sheet pan with cooking spray. 2. 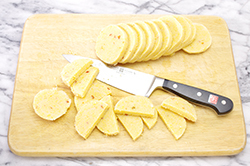 Remove the polenta from its packaging and slice it into 1/4- to 1/2-inch-thick rounds. 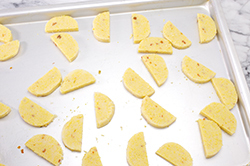 Place them in a single layer on the prepared pan. 3. 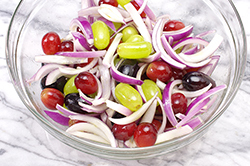 Toss the red onion and grapes with the olive oil and salt in a medium-size bowl. Scatter them over the polenta. 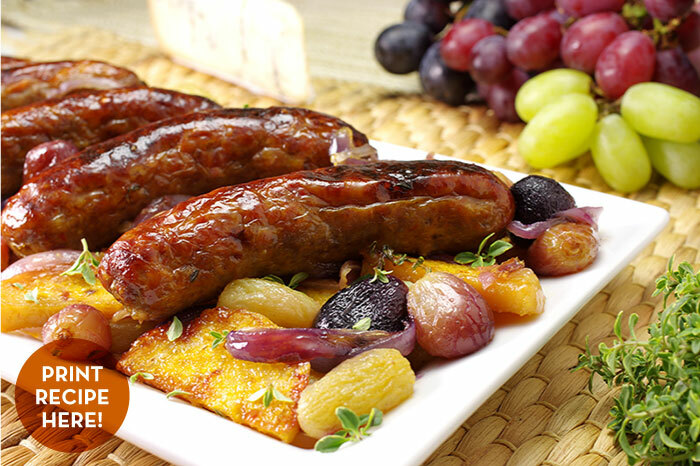 Arrange the sausages evenly around the grapes and onions, and prick each sausage once or twice with a fork. Sprinkle all with the fresh thyme leaves. 4. 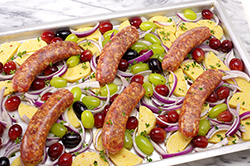 Bake until the sausages are cooked through and the grapes are starting to wrinkle about 30 minutes. 6. 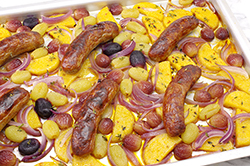 Serve the sausages over the polenta, onion, and grapes, with another 2 tablespoons Gorgonzola for topping, if you like.